Dr. Polly McKinstry grew up in Pennsylvania where both her father and grandfather were family doctors, igniting her early passion for medicine. She graduated Phi Beta Kappa, with Honors from Swarthmore College, and graduated from Yale University School of Medicine. Dr. McKinstry received her ophthalmology residency training at Albert Einstein/Montefiore Medical Center in New York where she began to specialize in eyes with a burgeoning interest in how surgery could be used as a tool to improve vision, eye health and the appearance of the eyes. She went on to complete a multidisciplinary fellowship in Ophthalmic Plastic and Orbital Reconstructive Surgery at the prestigious UCLA Jules Stein Eye Institute. Dr. McKinstry is one of a very select group of surgeons that are both board-certified by the American Board of Ophthalmology AND a member of the American Society of Ophthalmic Plastic and Reconstructive Surgery (ASOPRS.org). She serves as a member of the Education Committee and is also an Oral Examiner for ASOPRS. 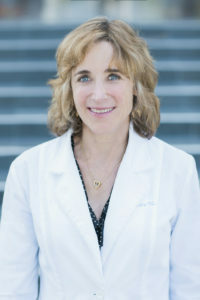 She has been an Assistant Clinical Professor at UCLA for years, and she continues to be one of the invited dissection course faculty for the UCLA Orbital Masters Symposium, and the UCLA Aesthetic Eyelid and Facial Rejuvenation Course for over thirty years. Dr. McKinstry practices in Laguna Hills, and also Newport Beach, California, where she is highly sought after for her expertise in Aesthetic and Reconstructive Oculoplastic Surgery. She is a skilled, compassionate physician known for the level of personal care and attentiveness she gives each patient. Your eyes are the first thing people look at, so any improvements radiate throughout your overall appearance. Learn how Dr. McKinstry can help you. Put confidence in a Dr renowned for her proven expertise in growth and tumor removal, injury repair, excess tearing, thyroid eye disease, and more. Relieve brow wrinkles, alleviate headache symptoms, and restore a beautiful appearance with an ophthalmologist who puts eye health and function first. -Dr typically in surgery on Thursdays.